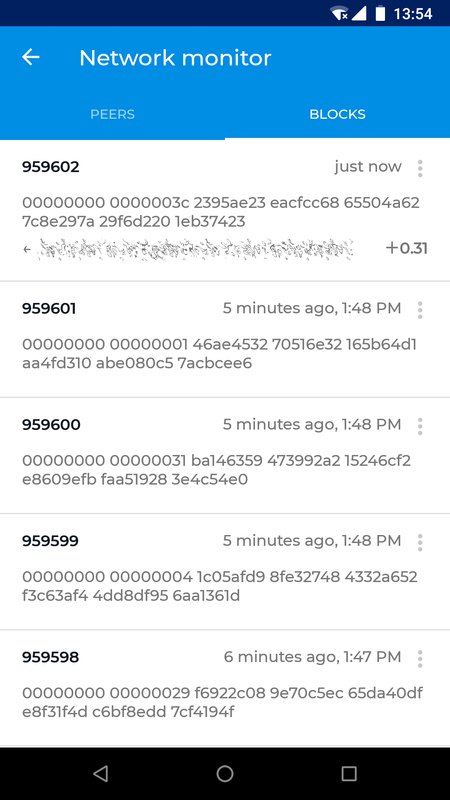 Your Android wallet allows you to manage frequently used addresses by adding a label to help you identify the owner. You can also label your own addresses in the wallet in order to keep track of regular incoming payments. 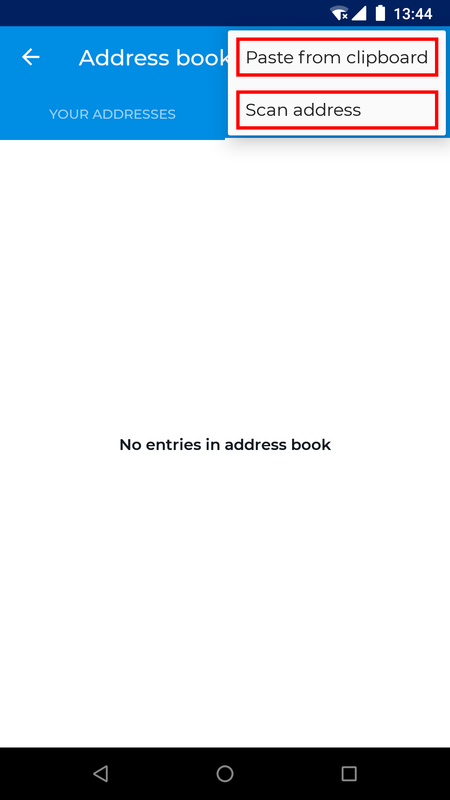 You can access the address book by tapping the Menu button, then Address book. This will display a screen where you can swipe left and right between your own addresses and the addresses to which you frequently send Dash, such as family members for example. 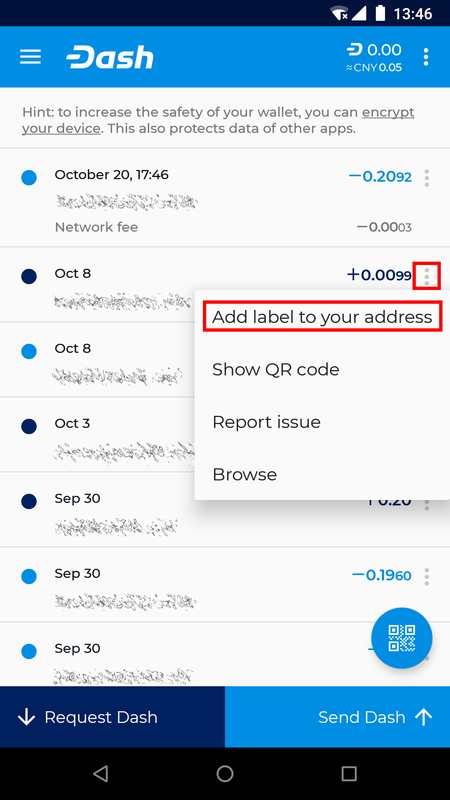 Tap the More options button to Paste from clipboard or to Scan address from a QR code, or tap an existing address to Send Dash or Edit the label. 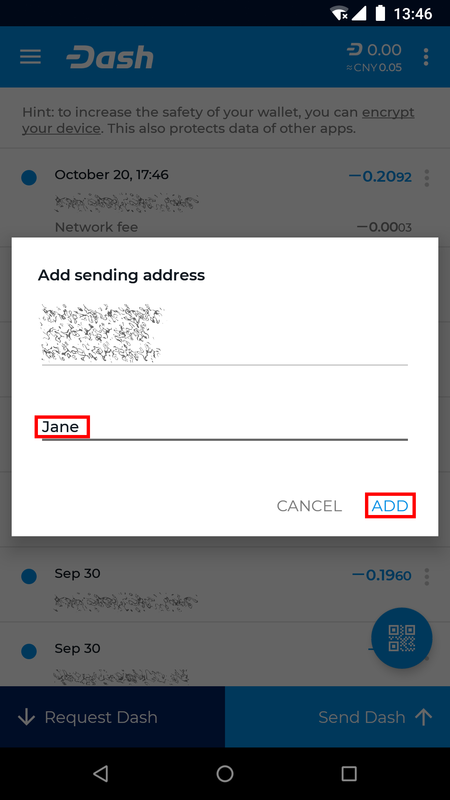 You can also add labels directly from the main transaction history screen by tapping the More options button for the transaction (three vertical dots) and selecting either Add label to your address, Edit label of your address, Add sending address or Edit label of sending address. 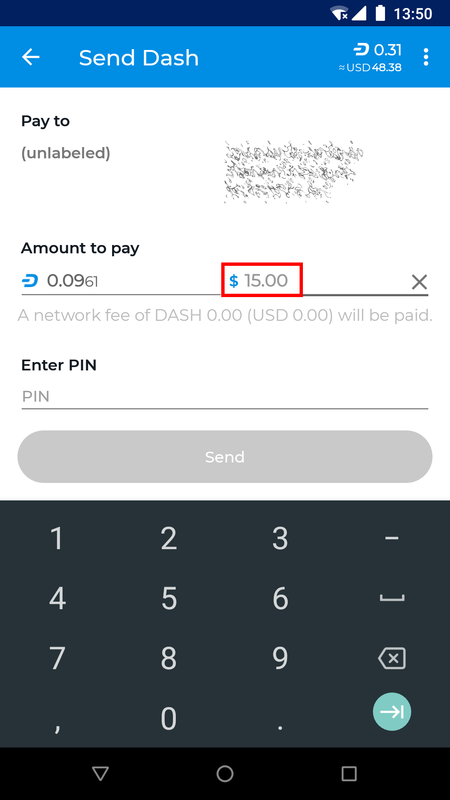 Dash Wallet for Android allows you to display the equivalent value of your Dash balance and in transactions by selecting a default fiat currency. 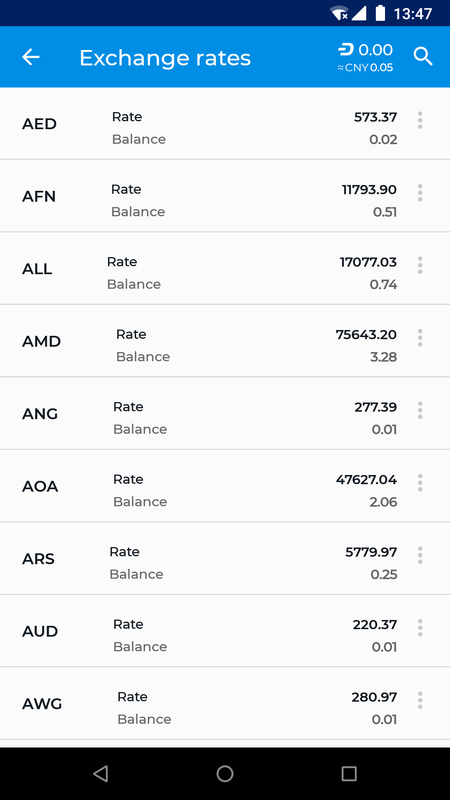 To select a default currency, tap the Menu button, then Exchange rates. 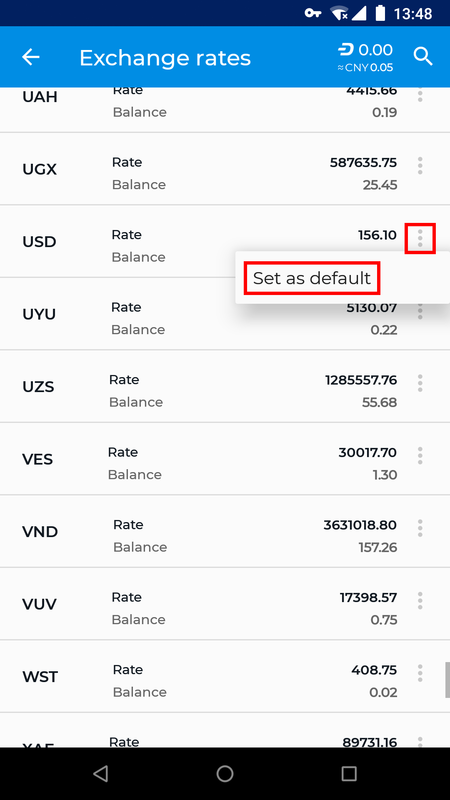 Find your preferred fiat currency, then tap the More options button for that currency and select Set as default. The exchange rate for this currency will appear when sending Dash, and you can also tap in the fiat currency field to enter the value in the fiat currency directly, instead of in Dash. 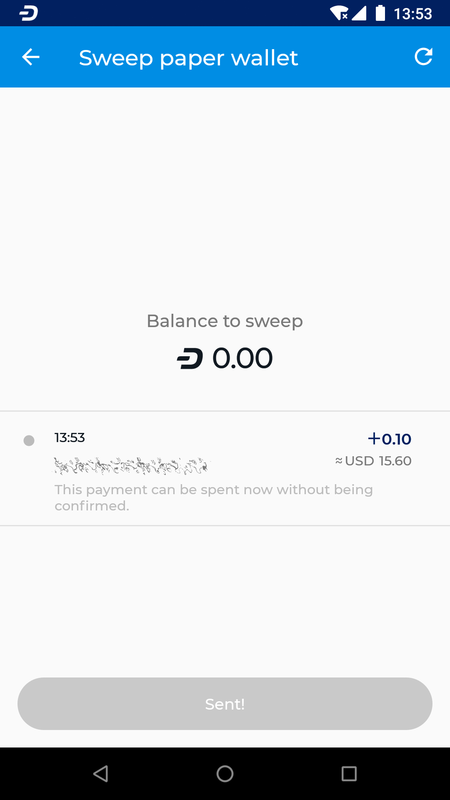 Sweeping a paper wallet is a method of transferring the value stored on an address you may have received as a paper wallet or from an ATM into your own wallet. You must have access to the private key for an address to use this function. 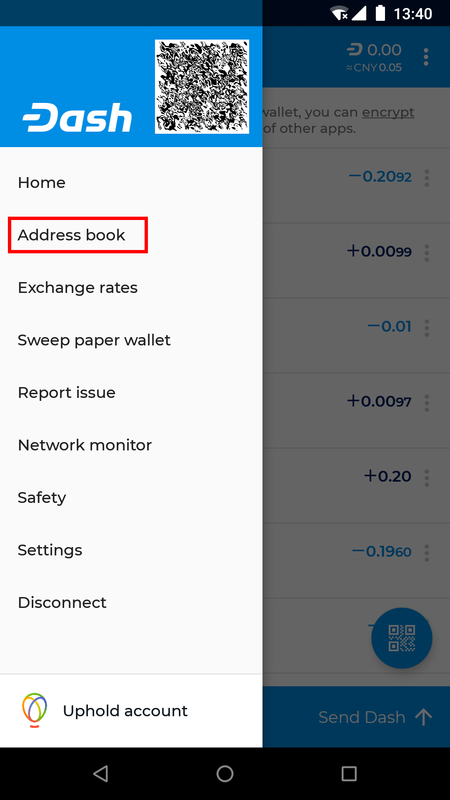 In this process, all Dash stored on the address will be sent to a new address that has been deterministically generated from your wallet seed. The private keys you sweep do not become a part of your wallet. To sweep a paper wallet, tap the Menu button and select Sweep paper wallet. 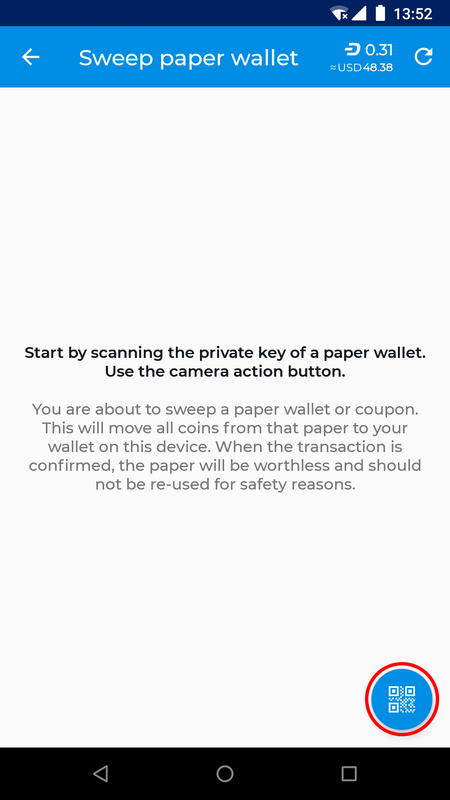 Tap the Scan button and scan the QR code from your paper wallet. Once the private key has been identified, tap Sweep to create the transaction moving the Dash into your own wallet. Once this transaction is confirmed, the paper is worthless and should be destroyed. 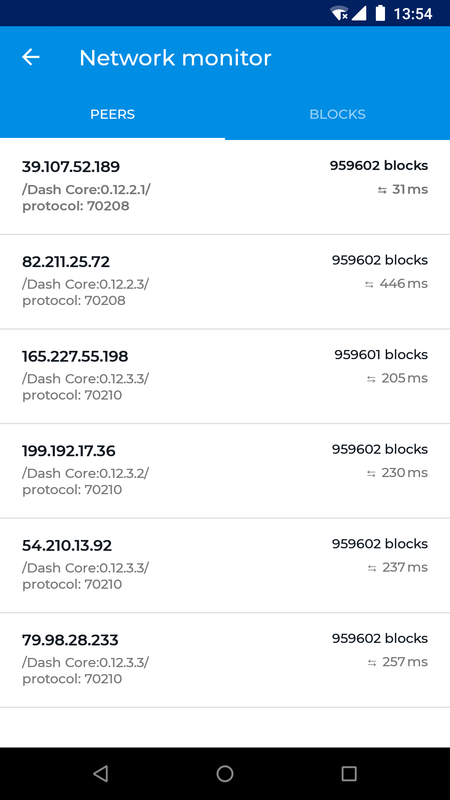 The Dash Android Wallet is a light wallet and functions in SPV mode, meaning it does not download a full copy of the blockchain. The network monitor allows you to view details about the full nodes to which you are connected. 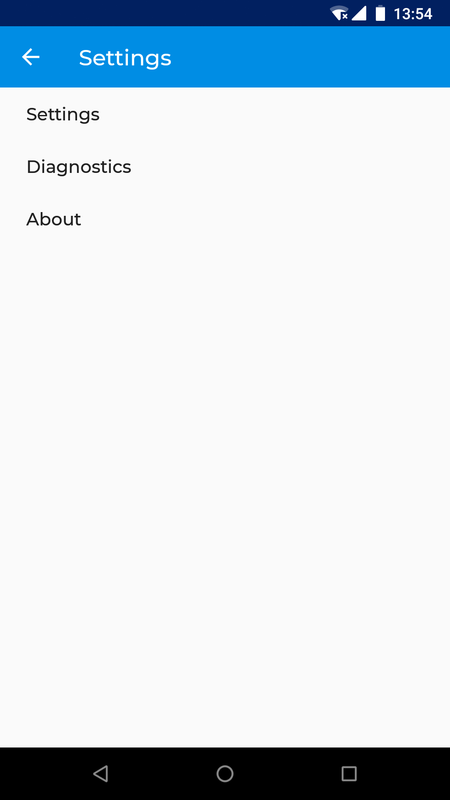 You can also swipe left to view blocks as they are created on the blockchain. The settings menu contains a range of options to control the behavior of the Dash Android Wallet. To access the settings, tap the Menu button, then Settings. You can then choose between Settings, Diagnostics and About, which displays wallet version, copyright, license and source code information. Enter a short name to be included in your QR codes when displaying to other users for scanning. The short name will then appear as a label in their wallet to verify the recipient and simplify address management. 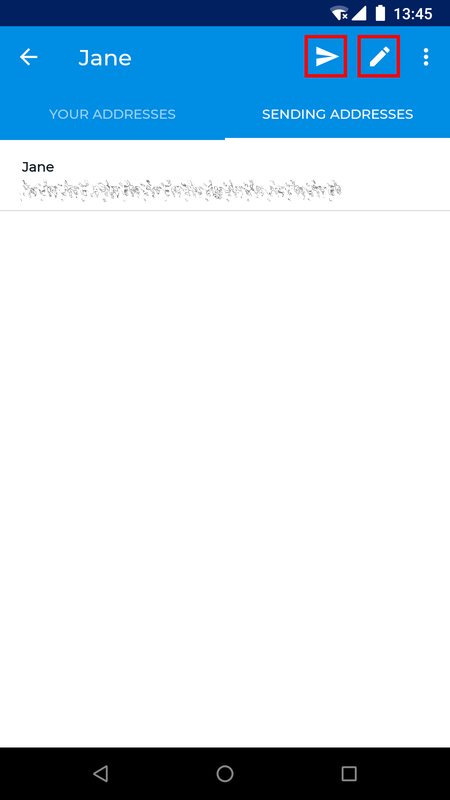 Specify whether or not to close the send dialog once a payment is complete. Enables display of an indicator in the Android notification area to be able to quickly verify connectivity. Enter the IP address or hostname of a single peer to connect to. Enabling this option prevents automatic peer discovery and forces connection to the one specified trusted peer only. Allows you to select which block explorer you want to use for functions linking to a block explorer. Links to the Android Data usage function to view and/or restrict data usage for the app. Enables an Android system notification to remind you of any unspent Dash if you don’t open the app in that time. 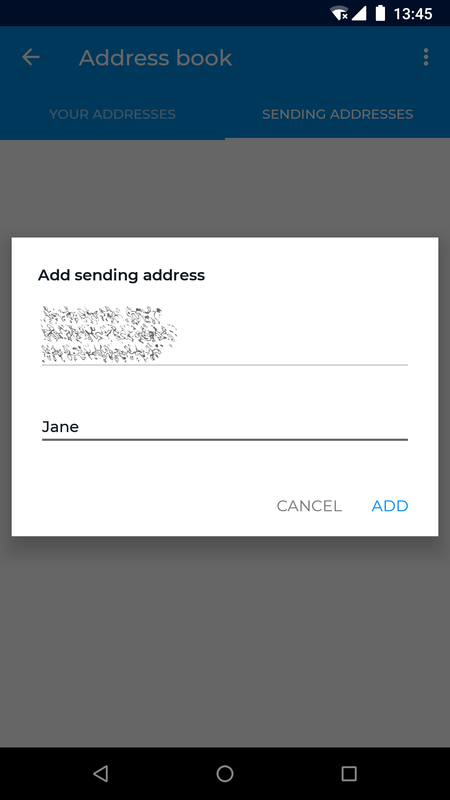 Enables functionality to use InstantSend to send and receive Dash. Enabling lite mode reduces bandwidth usage. Enables or disables various disclaimers and warning messages in the app. Enables use of the BIP70 payment protocol to add further verification and security features when scanning QR codes. Enables use of DNSSEC to attempt to identify a wallet name when creating transactions. 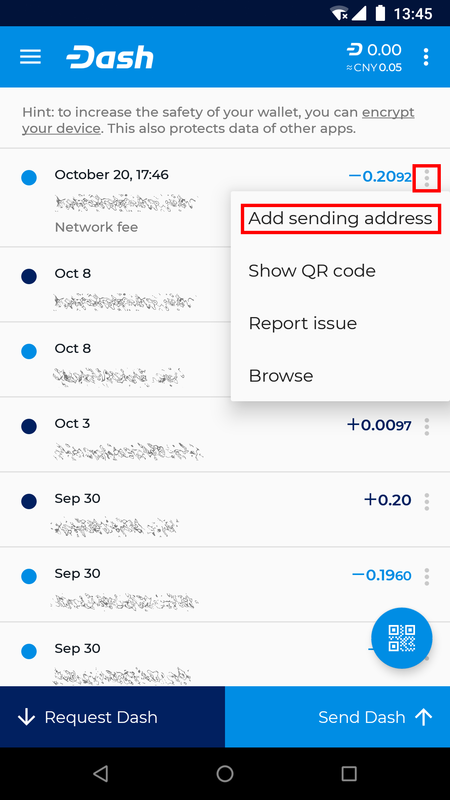 Allows you to gather a range of information related to your wallet in order to send a bug report to developers for troubleshooting. 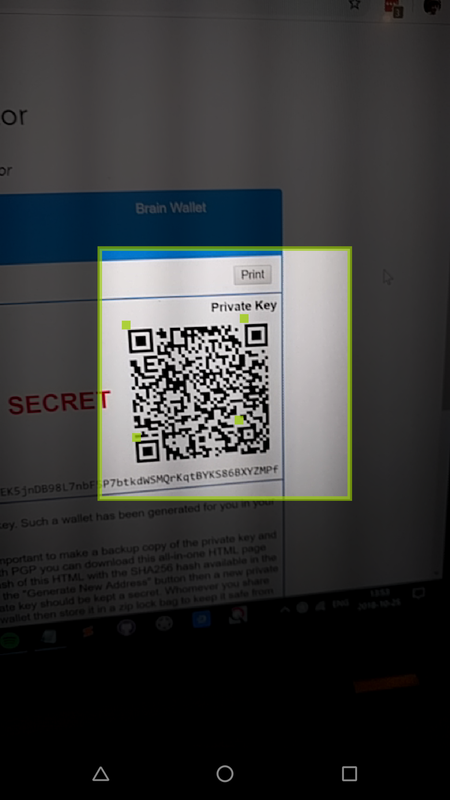 Displays the extended public key for the seed used to generate addresses in your wallet. Providing your xpub to a third party will allow them to view your entire transaction history, but not make new transactions. Resets data stored on your device relating to the blockchain. This data will need to be collected again from full nodes, similar to when setting up a new wallet. This process may take some time.